Sweating is the natural mechanism to control our body temperature. However, some people sweat more than all others. They might be suffering from a condition called hyperhidrosis due to their hyperactive sweat glands. While heredity can be one of the causes of this condition, there are many others that include hormonal issues, infection, prone to stress, anxiety etc. Hyperhidrosis may be generalized meaning all your body sweats a lot or it may affect some parts only such as palms, underarms, feet, and groin. Although this condition of excessive sweating is not dangerous but is embarrassing and of course uncomfortable. It also leaves you with unpleasant body odor. 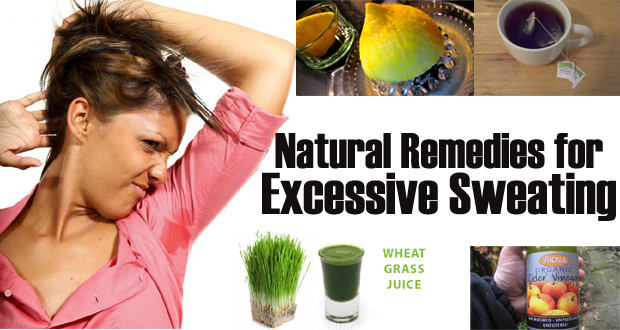 You may opt to use certain home remedies for sweating to address your discomfort. Apple cider vinegar is the mother of home remedies as it is used for various conditions, including sweating. This vinegar balances the pH level of your body areas like armpits or feet so that bacteria find it difficult to thrive there. Here are some ways how to use ACV for eliminating sweating. If you suffer only from armpit sweating, apply some apple cider vinegar to this area at night and go to sleep. In the morning, just wash off with water. If you suffer from sweaty feet, wash your feet properly with mild soap and warm water. Dry it and then apply some apple cider vinegar. You may also soak your feet. Add about half a cup of apple cider vinegar to about a liter of water. Soak you feet in this solution for about 15 minutes to help reduce perspiration. If you suffer from generalized sweating, it’s better to consume apple cider vinegar internally. Either add 1-2 tbsp of ACV in a glass of water and have it daily or add 2 tsp of honey to two tsp of vinegar and have it on an empty stomach in the morning. There is certain acid present in sweat which not only helps bacteria thrive but also produce a foul smell. Baking soda is alkaline in nature and thus lowers pH level of your sweating body parts by counteracting with acid there. It not only reduces perspiration but makes you get rid of body odor too. Just dust some baking soda where you sweat the most. You may also make a natural deodorant with baking soda which is our next remedy. Commercially available deodorants are loaded with chemicals that may harm your skin. And they are not meant for people who perspire a lot making them ineffective most of the time. The solution lies in making your own deodorant at home with baking soda as the main ingredient. You have known in the previous remedy how effective baking soda is in controlling sweat. When mixed with a fragrant essential oil, they may also keep you refreshing for the whole day. Mix water with baking soda to get a thick paste-like consistency. Add your choice of essential oil to this. Apply this to your armpits. You may or may not wash it off after 15-20 minutes. Mix equal parts of lemon juice and baking soda. With the help of cotton pad, apply this mixture under your arms to get rid of sweaty armpits. Wash off after about 20 minutes. Coconut oil has been used in some parts of the world, especially Asian countries like India and Sri Lanka for various purposes. One of the uses of this oil as a massage oil for its wholesome benefits for the body. If you do not suffer from generalized sweating, you can omit the massage part and just use coconut oil underarms. Coconut oil has lauric acid in it which can eliminate bacteria that cause sweat with odor. One of the myths attached to coconut oil is that it stains clothes but if you take a small amount of oil and massage it well into your skin, it will not even stain your clothes. The light fragrance of the oil also keeps you refreshingly fresh. You just have to take a little coconut oil onto your fingers and rub it under your arms to get rid of sweating. Or make this natural deodorant using coconut oil and baking soda at home. You now know the benefits of baking soda as well as coconut oil in combating sweat and its odor. If you feel its a little cumbersome to mix the ingredients every time you need to apply it (and that’s daily, even more than once daily! ), why not make a deodorant using these ingredients and store it to use it daily just like you have been using those commercially available deodorants and antiperspirants. Here’s the recipe for you. Using a double boiler, melt coconut oil and Shea butter over medium heat until they are just melted. If you don’t want to use a double boiler, heat some water in a saucepan. Place coconut oil and Shea butter in a glass jar with lid. Leave the jar in the hot water into the saucepan. This will melt both your ingredients. Remove from heat and add baking soda and arrowroot and mix well. If you wish, you can fill it up into an old deodorant stick. This will melt though when it’s hot. You may keep this stick in a refrigerator so that it doesn’t melt. Tea has tannic acid in it. This acid has anti-perspirant and astringent properties. The astringent properties make the sweat glands constrict so that they may not transport much sweat to the outer skin. On the other hand, anti-perspirant properties reduce perspiration. While you can always wet tea bags and hold them under arms to control armpit sweating, tea bags actually make a great foot soak to get you rid of feet sweating. Fill a foot bath basin with hot water. Let them steep till the time water gets warm enough to soak feet. Sage herb has many qualities that make it an excellent anti-perspirant herbal remedy. The leaves of sage have tannic acid in them. This acid, due to its astringent properties, constricts the sweat glands and help in reducing perspiration. Sage is also anti-bacterial and anti-fungal and thus restricts the growth of bacteria that give rise to sweating. take 1 tsp of dried sage leaves. Boil them in 1-2 cups of water. Let it cool down till it reaches room temperature. Use this water to thoroughly clean your armpits, hands, feet, soles or wherever you get more sweat. Apply this at least three times a day. Make a sage tea by steeping 1 tsp of sage herb in a cup of hot water for 5-7 minutes. Have this tea before going to bed at night. You may also add some lemon juice to this. Add 1-2 tsp of sage herb in a foot basin filled with hot water. Let it steep till the water becomes tolerably warm. Now soak your feet in this water for 20-30 minutes daily. This cures your foot sweating. One of the tasks of sweating is to maintain body temperature and keep you cool. Another task is to get the toxins out of the body. If you drink a lot of water, you help your body in maintaining its cool temperature and also in flushing out toxins through urine. Therefore, your body needs to produce less sweat. Water also keeps you calm and composed when there occur stressful situations. Stress, as you know, is one of the major causes of sweating. It is, therefore, a good idea to drink a lot of water. Why only water, you should actually have other fluids too so that you can replenish the minerals that you lose through sweating along with toxins. Some of the drinks that you can have along with water can be found in the following list. The fragrant chamomile has antibacterial, astringent, and deodorant properties, making it ideal for sweat remedy. While its anti-bacterial properties can eliminate the odor-producing bacteria, the astringent properties can constrict the sweat glands to produce less sweat. The deodorant properties don’t need to be expressed as it will keep you fresh throughout the day by countering the body odor due to excessive sweating. Make some chamomile tea by steeping 1 tsp of the herb in a cup of water and have it. You may also let the tea cool down and then soak a cotton ball or pad and wipe with this underarms and other sweaty areas of your body. Dilute chamomile oil with coconut oil and rub your sweat prone body areas with this. Precaution: Those allergic toasters, chrysanthemums, ragweed, etc. should avoid using chamomile. Witch hazel is the natural astringent derived from the leaves and bark of witch hazel shrub native to North America. Witch hazel has been used as a traditional remedy for various conditions like sores, bruises, swelling and general skin care. It can be found easily in most of the homes in America. Witch hazel extract contains tannins, gallic acid, catechins, flavonoids, essential oils like carvacrol, eugenol, and hexenol, choline and saponins. Although you can use witch hazel for generalized sweating, it is especially useful for stopping facial sweating. Perhaps this is the reason why witch hazel is extensively used in aftershave lotions. Due to its strong astringent properties, witch hazel shrinks the pores of skin thus preventing sweating. Take a cotton pad and soak it in witch hazel extract. Now apply this to your sweaty body parts like armpit, feet and even face. Along with all its goodness due to its antioxidants, tomatoes are also astringent that help shrinks pores. It also has cooling effects. Having tomato juice is a folk remedy for sweating but it seems to work well in reducing sweating as experimented by many people. Just have 1-2 glasses fresh tomato juice daily for a week. Thereafter you may reduce the amount and have it on alternate days. You will yourself notice the difference in the amount of your perspiration. Deficiency of magnesium too sometimes leads to profuse sweating. On the other hand, excessive sweating continuously for long hours every day may also lead to a deficiency of magnesium in your body. It is like a vicious cycle. Therefore, have magnesium-rich foods because this mineral also helps regulate body temperature. It also decreases anxiety which is yet another cause of sweating. You may also opt for magnesium supplements after consulting your doctor. Here is a list of some foods rich in magnesium that you can add to your daily diet. Tea tree oil is an excellent natural astringent and an anti-fungal agent too. Therefore, it is extensively recommended by herbalists to control foot sweating. You just need to apply a little oil where you sweat more. Take a little tea tree oil in a cotton ball. Apply on your sweat prone body areas like armpits, back of the neck, feet, face, groin area, inner elbows and behind the knees etc. If you find it too strong, dilute the oil with water. You can add 4-5 drops of oil to half a cup of water and then use this solution in the same way. The very healthy wheatgrass juice is also good to control sweating. It is a very rich source of such nutrients as vitamin A, C, B-12, B-6 and folic acid. It prevents sweating by controlling the activity of acids and toxins in your blood. Actually, it helps neutralize and dilute toxins in the blood so that they need not be flushed out through sweating. You just need to have one glass of wheatgrass juice daily to reduce your sweating considerably.